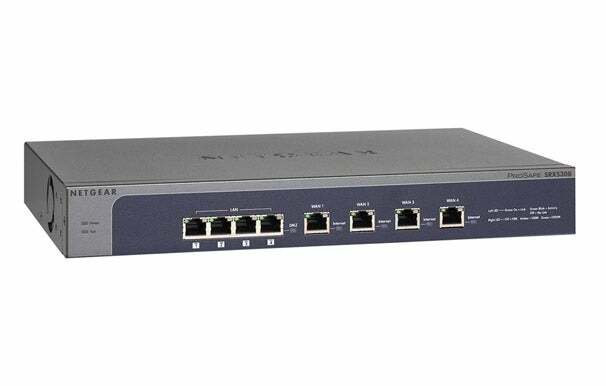 Today, Netgear released the ProSafe Quad WAN Gigabit SSL VPN Firewall (SRX5308), a business firewall appliance that, at $500, is priced for the small- to medium-sized business IT budget. The SRX5308's throughput is probably its most compelling feature; with an advertised speed of over 1Gbps and support for two different modes of load-balancing on its 4 WAN ports, Netgear wants to position itself as a speedy-not-spendy alternative to high-end enterprise firewalls. In addition to the 4 WAN ports, the SRX5308 also has 4 Gigabit Ethernet ports for high-speed LAN access, one of which can be set aside as a hardware DMZ port if you have outward-facing servers. SMBs looking to simplify their VPN setup might also be intrigued by the SRX5308's support for both IPSec and Secure Socket Layer (SSL) VPN access. While enterprise firewalls have had support for SSL VPNs for a while now, most budget-friendly firewalls only supported IPSec, which typically requires more IT time and money to set up and use than the SSL equivalent. The SRX5308 supports up to 125 simultaneous IPSec VPN tunnels and 50 simultaneous SSL VPN tunnels. Of course, saving a few bucks on a business firewall doesn't mean much if you have to spend a few weeks learning how to set the thing up. Fortunately, most of the configuration can be done via ProSafe Control Center GUI or Install Assistant wizard, and a specialized IPSec VPN wizard is included to help with VPN setup. Also, it does support a command-line interface for the CLI pros, as well as remote configuration via Netgear software (sold separately). The SRX5308 also pairs with Netgear's ProSecure STM appliances to provide antivirus, anti-spam, URL filtering, and email security at your gateway, streamlining your network security needs. Don't forget to read up on more coverage of Netgear's other SMB-oriented products, like the ProSecure UTM and ProSafe Wireless Management lines.